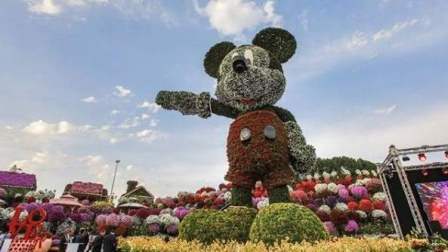 To mark the 90th anniversary of Disney's first character, Dubai Miracle Garden constructed the world's biggest Mickey Mouse floral sculpture that was unveiled on Sunday. The sculpture, which is Disney's first character floral display in the Middle East, stands at 18 meters long and consists of almost 100,000 plants and flowers, weighing about 35 tonnes. Through it, Dubai Miracle Garden earned the Guinness World Records title for the Tallest Topiary supported Sculpture. As part of a new licensing deal between the Dubai Miracle Garden and The Walt Disney Company, six more Disney characters will be installed in the garden in November when it reopens for its winter season. Eng. Abdel Naser Rahhal, Creator & Co-Founder of Dubai Miracle Garden and Vice Chairman of Cityland Group, said the supported sculpture was the result of 45 days of work for 100 laborers, designers and engineers. It features almost 100,000 plants and flowers (including White Petunia, Red Petunia, White Geranium, Yellow Viola, Zinnia Marigold and Green Alternanthera), and is supported by a 7-tonne steel structure with a concrete foundation of 50 tonnes of reinforced concrete. Chafic Najia, Senior Vice President and General Manager of The Walt Disney Company Ltd, said that the floral statue aims to provide residents with a local Disney experience. "Mickey Mouse is one of the world's most iconic and beloved characters, and we are proud to be able to celebrate such a unique touch point at the Dubai Miracle Gardens with UAE residents and visitors, and enable them to connect with Disney and our characters," he said. Mickey Mouse floral statue is Dubai Miracle Garden's third record. The garden is the owner of two other Guinness World Records titles, having been recognized for having the 'Largest Vertical Garden in the World' and for the 'Largest Floral Installation' with the Emirates A380 display. Dubai Miracle Garden will be open at 9:00am to 9:00pm on weekdays and 09:00am to 11:00pm on Friday and Saturdays. Regular admission is Dh45 for adults and Dh35 per head for children (from 3-12 years). Entry is free for people with disabilities and children under 2 years of age. The world's most popular man Walt Disney initially faced failure when he created Oswald the Lucky Rabbit, a character that Charles Mintz of Universal Studios later took credit for. Determined not to give up to disappointment, he went back to his studio and started sketching the character that would become the symbol of the world's largest conglomerate and one man's persistence: Mickey Mouse. One's man ambition is now behind the films and music that raised generations who took their inspiration and life lessons from the compelling storytelling techniques; the parks and resorts that continue to provide millions of families from all around the globe with the most memorable entertainment experience to ever remember. Until today, the Disney company is protective of the use of Mickey Mouse, not allowing any use of the animation without giving copyrights to the entertainment conglomerate.